Please Note: We no longer have our Black Building location. 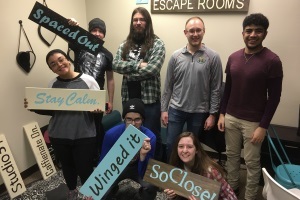 All of our escape rooms are in our Syndicate Building location. 606 1st Ave N, Downtown Fargo. The prankster has struck again. He has stolen the Bison's playbook and nobody knows what he's going to do with it. You need to search his ultimate Fan Cave to recover it. Can you locate it in his Fan Cave before any of the other teams can get their hands on it? 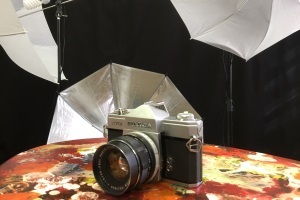 A famous bird photographer has disappeared and you have been asked to look into her disappearance. Watch out for the men in black because you are not alone in the investigation. Can you figure out why she disappeared before they do? Our own Professor Chronos Zeitenspiel has succeeded in inventing a time machine. You were invited to a demonstration of the device but unfortunately something has gone wrong and the Professor is lost in time. Can you help the Professor return to our time before the machine's battery runs out in an hour? C.J. Kask was a famous explorer from the early 1900's. A selection of his artifacts including the body of the vampire, Prince Zoric, is on display. Unfortunately, the stake was removed from the body of the vampire. Can you find it and lay him back to rest before he can escape his coffin? Your best friend is getting married but the Best Man is in love with the Bride and has hidden the marriage certificate so she can't get married. 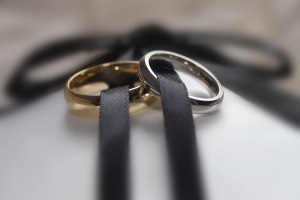 Can you search the Chapel and find it before the officiant decides to call off the wedding? The North Pole is missing. Not the location but the actual pole that marks the North Pole. And with it gone, Santa's power to bring Christmas magic to the world is gone. Who stole it? Santa's sister, Sandy Claus. She's tired of the cold and snow. 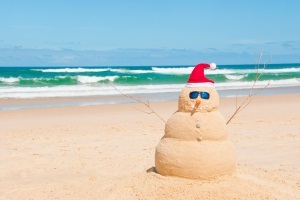 She prefers a sandy beach to the ice of the north. Can you recover the North Pole from her and rescue Christmas? All games are $26 per person. Puzzled Escape Rooms is the first Downtown Fargo escape room and offers six differently-themed escape rooms. From fortune-telling to vampires and weddings to the NDSU Bison, we have the theme you want to play. Come play the Downtown Fargo escape rooms and be in the middle of the action. Our escape rooms are fun, interactive experiences for friends, coworkers and the entire family. Search for clues, solve the puzzles and discover the mystery of the room. You must be fast because you only have 60 minutes to do it. Go to our Booking Page. 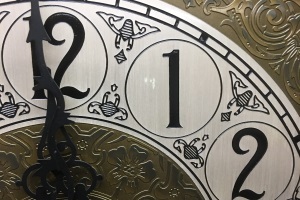 Choose the date, time and theme for your escape room adventure and complete the form. You are all set. All of our rooms have many clues inside; some hidden, some in plain sight. Find the clues and use them to solve the puzzles one-by-one. 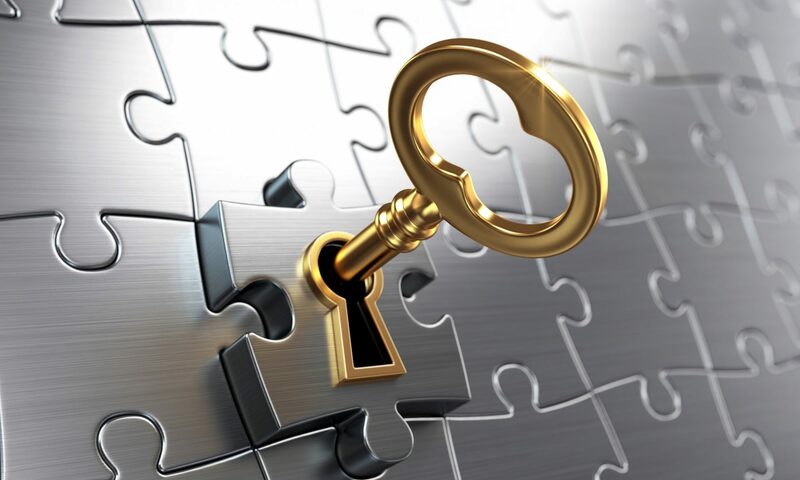 All of the puzzles in our escape rooms propel you toward the solution to the mystery. Solve the puzzles and discover the mystery. Our escape rooms help you ditch your phones and reconnect with your friends and family in person. 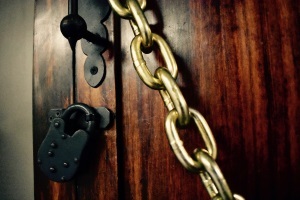 Make an escape room part of your family game night. 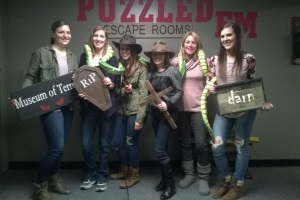 Our escape rooms are a high-quality team-building exercise for your office. Participants learn communication, cooperation and problem-solving. 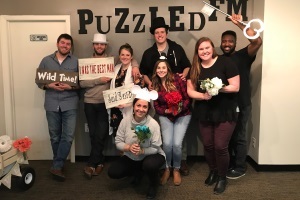 Whether you are celebrating a birthday, anniversary, or bachelor / bachelorette party, add to it with the excitement of one of our escape rooms. No. The doors are not locked and if you need to leave to answer a phone call or the call of nature, the game will not stop. But, neither will the clock. No. Although there is a vampire figure in our Museum of Terror, none of our rooms are scary. If the room you want to play is not available, please email us or call us and we can try to make whatever schedule changes you may need. Don't be shy. We don't bite. I want to put together something for my company. Awesome. We would be happy to work with you to build an event for your company. Go ahead and email or call us. Can we bring adult beverages into the room? No. City ordinance requires any establishment where alcohol is consumed to have a liquor license and Puzzled Escape Rooms doesn't have the required license. Besides, alcohol and escape rooms don't mix well. You need to stay sharp in order to solve the puzzles. However, there are a number of popular restaurants and pubs downtown within walking distance where you can celebrate your victory or drown your sorrows afterward. Will we be in with strangers? While it doesn't happen often, our rooms are public and if you don't take all the spots in a room, another group could book in with you. But, it isn't as scary as it sounds. Everyone is there to have fun and solve puzzles. Which rooms do you recommend for beginners? 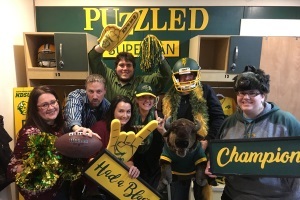 Our NDSU Bison Fan Cave is our easiest room and would be great for beginners. 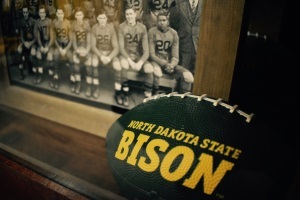 You don't have to know anything about the Bison or football to enjoy and win. Our Museum of Terror is also a good choice. Despite the name, it isn't scary and is a little bit more of a challenge for beginners than the Fan Cave. I would like to bring a group of kids. What should I know? All of our rooms are kid-friendly and we've had groups of 9-12-year-olds play and win in all of our rooms. We would like to have an adult in the room with any group of kids 13 or under.